Longtime residents of Sharpsville can tell us a lot about the history of this Pennsylvania borough. Please welcome Donna DeJulia, a 1960 Sharpsville High School graduate and our guest writer this month. 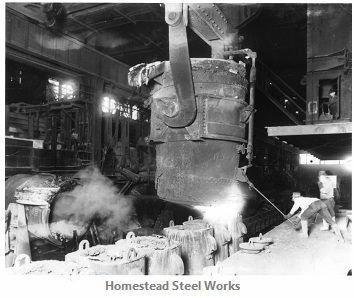 She fondly describes her father, a hard-working steel mill worker whose parents had come from Italy, and her mother who saw Sharpsville as a place in which to settle down and raise a family in peace and security. Ladle in the Homestead Steel Mill. I was born and raised in Sharpsville, Pennsylvania, as my father was. His family came from Italy and bought a house at 42 North Eleventh Street down by the railroad tracks. All my life he had told me wonderful stories about his upbringing. Even though they had very little it sure sounded like he and his family had a lot of fun. Dad told me how, when they were dirt poor and had nothing to eat, he and his brother broke into a train and stole cans of Spam and pineapple that were for the troops overseas during World War II. They took these canned goods and buried them in their backyard. The Conrail police came and searched in vain for the stolen items. In any case, the DeJulias were no pillars of the community! And they had so much Spam and pineapple that my Dad would never eat those two foods for the rest of his life! When my parents married, they settled in Sharpsville where Dad worked at Shenango Inc. steel mill for over 40 years. A bricklayer by trade, he would climb into those big ladles (like the replica in the Sharpsville town park) and line the inside with brick before they poured steel into them. Even after the owners, the Shenango Group of Pittsburgh, went bankrupt and sold the plant to its employees in 1993, he was still going over to the mill and training people. It’s funny how two words can be so complicated … “About Mom.” I could describe her physically…but that tends to change with time and it doesn’t entirely answer who she is. Her hair color fades and her waistline grows and then shrinks. There is also this wrinkle in her brow that is deepening every year. Her body is stiff when she awakens. If she doesn’t get a cup of coffee and her bra on first thing in the morning she can’t think. All this is from years of stress and happiness both from raising her children and grandchildren, not to mention the couch campers that would hang out in her house. Random people have always slept and ate at my mom’s house. 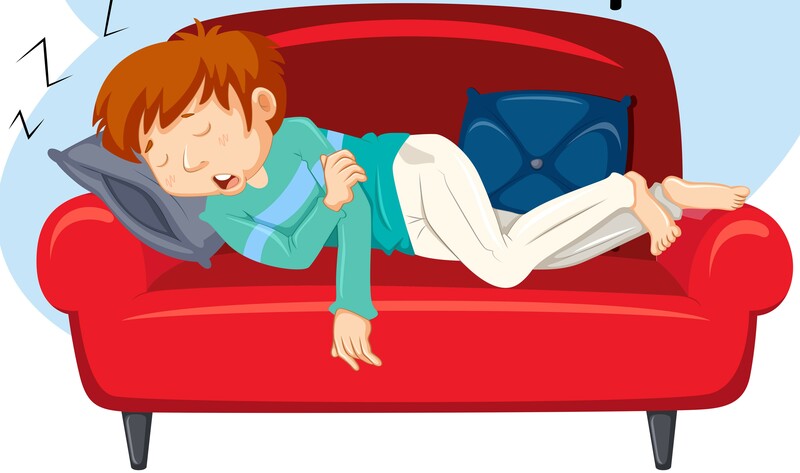 You may stop by in the morning and find a foreign body lying on a couch or floor, bundled in a blanket, not realizing who they are until they rise. They could be friends of her four children or friends of her 14 grandchildren. Who knows why they felt more comfortable in her home than in their own homes. If nothing else, there was always someone in Mom’s home with an ear to listen to whatever crisis they may be going through at the time. My mother lived in Sharpsville for 50 years. She still had her original telephone number she got in 1958, so I guess that would indicate a sense of stability. She may not have had beautiful furniture, a refrigerator full of food or even a lot of personal belongings. The pipes under the kitchen sink were broken, her porch roof fell off and the carpet was shabby, but we still called it home. But one thing she does have is a lot of love and understanding to share and she is always there for her children no matter what they are going through. About Mom?… Maybe her personality is a clue. She believes in the magic of the moment and that everything in life happens for a reason. What the reason is, is really none of her business. That is for God to know. But she trusts in him and feels he know what he is doing. She believes that laughter heals. She believes in hope. She likes looking way up into trees and examining each leaf that God has created. She believes that children are meant to be heard and have feelings and thought just like adults, but sometimes they are just not given the opportunity to express it. She enjoys a good book. It can take her anywhere in the world and she never has to leave her home. She does not like bigotry or racism and she can barely tolerate ignorance when it comes to diversity. She believes that all people are created equal and are entitled to their opinion just as long as it does not harm others. I learned from her that for the most part there is good in every person. Sometimes you have to look real close, but it is there. This is a glimpse…about my mom. All Mom ever wanted to do was to live in one house, raise all of her children and have them go to one school district. You see, she moved all over as a child and attended 22 different schools, so that was her and my father’s dream. After 45 years of marriage her husband had passed on and all of her children are grown. Her job in her falling-down house was done. It was time to move on and take care of herself. This is something she has never really done because she has always taken care of everyone else. So, Mom is no longer in Sharpsville, she has left Mercer County to start a new life, a well-needed life that revolves solely around her. It is about time! Well, on the 12th of July my father has been gone for 10 years. I have this dreaded fear of losing the memories I have of him. The red flannel shirt he always wore. The way he rode through town on his bike and everyone knew him. How he spent the 68 years of his life in Sharpsville, working, raising children and spending quality time with his family. I rarely remember the man getting angry but when he said to do something, you did it. I remember the fascinating stories he would tell how he and his seven siblings grew up on Eleventh Street in Sharpsville. He was not an educated man, he could hardly read, but he was the smartest man I ever knew. If it was broken, he could fix it. He took people’s malfunctioning VCRs, TVs and any other things that he felt was worthy and fixed it new. He would then give them away after they were repaired, never taking money for them. He had collected so many extra bicycle parts that every kid in town would bring their bikes to be fixed. After he died I had 6 broken VCRs in my closet. I just couldn’t throw them out, not now! Dad may be back to fix them. It was a good three years before they made their way out to the trash. When my father died on July 12, 2002, I was devastated. It was so unexpected. He was a healthy vibrant man at the age of 68. He rode his bicycle at least 10 miles a day. It was a weekly routine to peddle through town on trash day looking through people’s garbage to see what he could salvage, being the great repairman that he had turned into being after he was forced into retirement in 1990 at the ripe old age of 57. He would scout around and then in the evening he would have my niece take him around in the car and pick up those televisions, VCRs, stereos and anything else that could be restored. He did not drive, never possessed a drivers license and could not read but was able to fix anything that was slightly fixable. Well, that morning he apparently got up early like he always did. 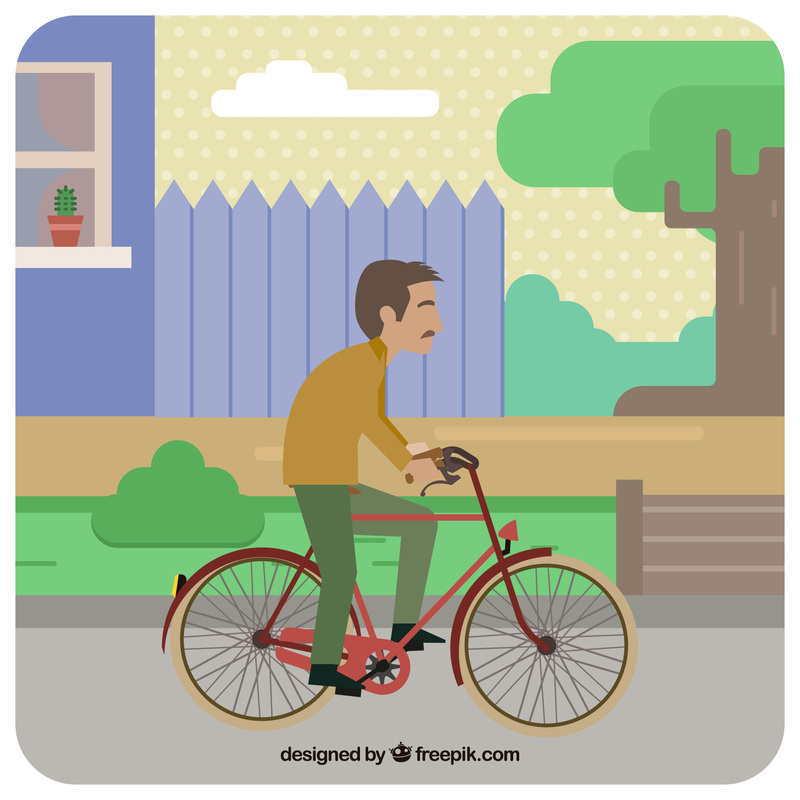 He ate half a bologna sandwich, then got on his bicycle and proceeded to peddle through town. When he arrived at the bank he started to ride through the parking lot, clenched his chest and died before he ever hit the pavement. Today, every now and then when I am home alone. 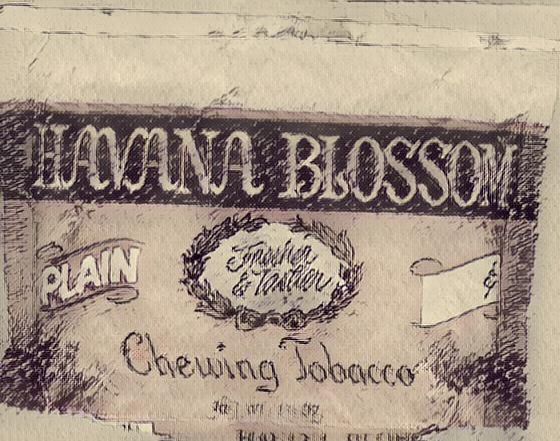 I can sometimes smell the faint smell of Havana Blossom Chewing Tobacco and Old Spice aftershave. It happened just the other day. I was lying on my bed resting and the window was opened. A small breeze blew across the little room and that smell hit my nose. I felt grateful and full of life. Those times that it happens is when I know my dad is visiting and telling me everything will be okay. When my father died I really became interested in the history of Sharpsville and have done quite a bit of research on it. Now when I go through the town everything looks different than it did in the 1970s. The buildings look smaller and the population has declined. 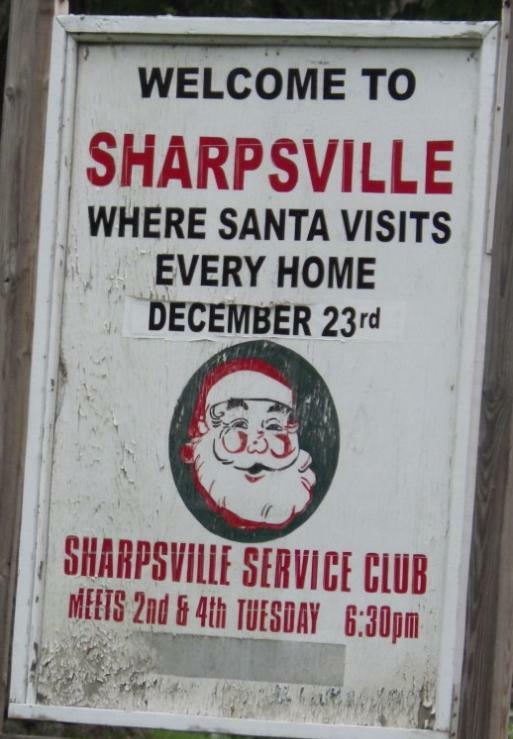 The sign still stands near the Sharon line stating that Santa Claus visits every house on Christmas Eve. The town still has only one traffic light and the new police station has no jail cell to hold local wrongdoers. My favorite bench with my initials carved in it has been removed from the town park. The old City Hall has turned into a floral shop. (In June 2017, a fire that originated in the basement badly scarred the City Hall and shut down the floral shop.) And I will never understand why Pierce’s mansion was torn down to build a housing complex. I remember when trains passed by my house daily and I hung out at the fire station and watched HBO on TV. No matter how the passing of time impacts the town it will always be my Sharpsville. — Donna DeJulia, (SHS 1960) Franklin, PA, 2012.